Crushed by the loss of steel and other manufacturing jobs, Cleveland has ranked high for poverty before - but never No. 1. That changed when a report from the U.S. Census Bureau recently rated it has the nation's poorest big city, putting it ahead of Detroit, Miami and Newark, N.J.
"To be ranked No. 1, that's bad," said Councilman Zachary Reed. "Let's be honest, the fact is people in our community are living in poverty and just making it day to day." The unwanted distinction is the latest in a litany of struggles for Cleveland, which appeared to be on the rebound over the past decade, with the Rock and Roll Hall of Fame, Cleveland Browns Stadium, Jacobs Field and Gund Arena. But this year the budget-strapped port city laid off hundreds of police officers and firefighters and reduced trash pick up and other city services. Hundreds of teachers and other workers were laid off from city schools and officials are pushing a $68 million tax increase on the November ballot to try to ease some of the schools' financial needs. With a poverty rate of 31.3 percent in 2003, Cleveland stands out even in Ohio: Cincinnati's was 21.1 percent, Toledo 20.3 percent and Columbus 16.5 percent. 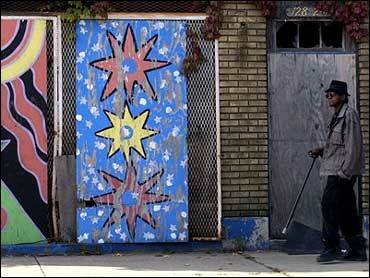 The overall poverty rate in the United States was 12.7 percent, according to the survey released Aug. 26. "I guess I am a little surprised, because my sense was that Cleveland was a city on the rebound," said Tom Kaplan, the associate director of the Institute for Research on Poverty at the University of Wisconsin-Madison. Despite Cleveland's thriving image in the 1990s, poverty was always in the background, said Myron Robinson, president of the Urban League of Greater Cleveland and co-chair of a newly formed civic committee on job creation. "We had probably about 42,000 African American males unemployed then, as now. It didn't get a lot of attention until now. It's like we hit rock bottom." The city remains home to a few steel and other manufacturing companies, many with scaled back work forces. Hospitals, banks, law firms and universities are other big employers in Cleveland, which has a 12.2 percent unemployment rate. That's nearly double the state rate of 6.3 percent in August, when the national rate was 5.4 percent. Deann Hazey, spokeswoman for the Convention & Visitors Bureau of Greater Cleveland, views tourism as one solution to the poverty problem. "We want to create a greater demand in the hospitality industries. Those with good people skills, not necessarily a college degree, can find a good job opportunity and work their way up," she said. Rose Blade lives in Cleveland's Mount Pleasant neighborhood, where well-maintained homes and businesses mix with those in disrepair. The former factory worker is among the thousands who are unemployed. "Things are really tough around here," said Blade, 45. "There's too many hungry people."